In his first job after graduating from Macomb’s Police Academy, Mitchell Oliver finds himself enjoying the peace he has been sworn to protect as one of 13 officers entrusted with 3.8 square miles of pure Michigan. Oliver graduated from Eisenhower High School and earned an Associate of Applied Science Degree in Law Enforcement from Macomb. He followed that up with 17 weeks of Michigan Commission on Law Enforcement Standards academy training, which, he says, prepared him well for his first job – with one exception. Oliver works 8 p.m. to 8 a.m. in a rotation that includes every other weekend off. The first half of his shift is spent downtown, assisting visitors, un-impounding bikes and gently directing patrons toward their hotels after the Pink Pony, Drought House or other similar establishments close. After 3 a.m., he travels to the other side of the island, patrolling the wooded areas and looking for anyone who may have inadvertently strayed from the beaten path. 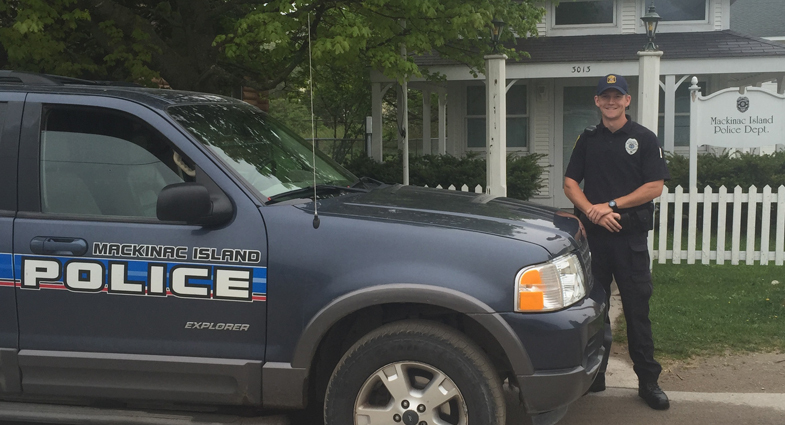 Oliver lives with four other Mackinac Island police officers in provided housing on Market Street not far from headquarters. On his days off, he may ride his bike to the ferry, pick up his truck in Mackinaw City and head to Cheboygan to go grocery shopping. Recently, he also enjoyed showing his family around the island, when his mom came up to compete in the Lilac Festival 10K run in early June.